In this final installment of the series, we present a Q&A with Dr Thierry Briche, ENT specialist, and the former chief of the prestigious Val-de-Grâce Hospital in Paris, France. He was kind enough to talk to us about the ear, its architecture, risks, and potential injuries. 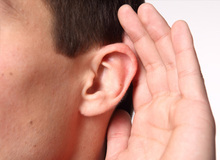 After discussing volume in the previous article, this time we'll focus on your ears. You're leaving tomorrow for a world tour or you’re beginning your studio session for the double album, “The Return of Abbey Road” , and of course, you wake up with a sore throat and a voice sounding more like a rhino scraping his horn on a garage door, than the flamboyant refrain of "We Are The Champions" which you were counting on… Don’t panic…….